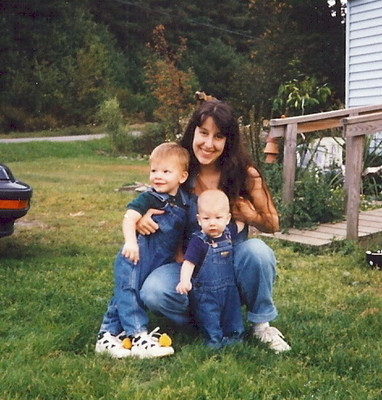 Jacob and Ethan are only fourteen months apart and so in some ways I consider them both to be my firstborns. The two oldest. 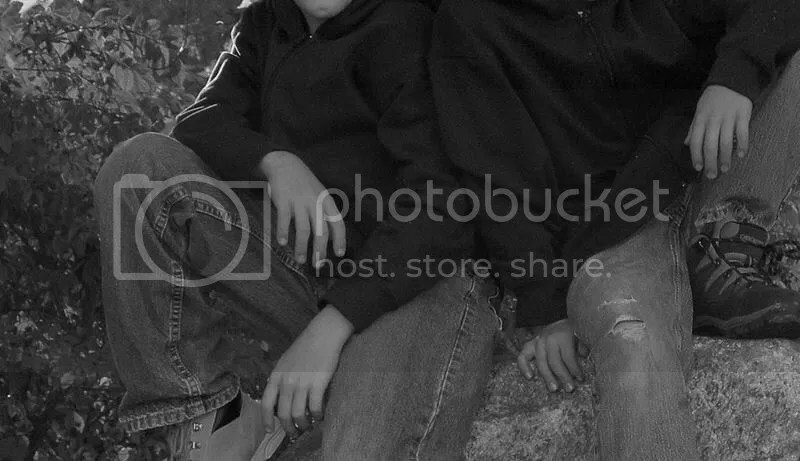 Rich and I lived near family until I was pregnant with Grace and so these two boys are the only ones of my five that my parents were able to spend lots and lots of time with as little ones. 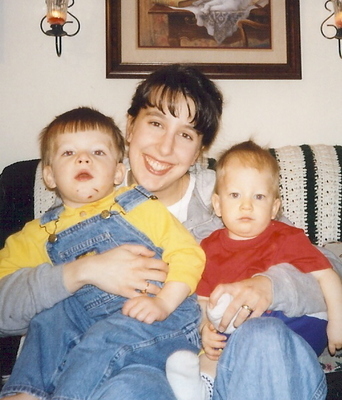 I am sure that they feel the same way that I do — that Jake and E are getting big and that time is quickly passing by. Jacob is almost as old as my younger brother was when I was married! When I watch the two of them together I often get that motherly intense contented feeling. I love how close they are. They are like cute puppies that play, wrestle, make messes, and all the time looking just as innocent as can be! 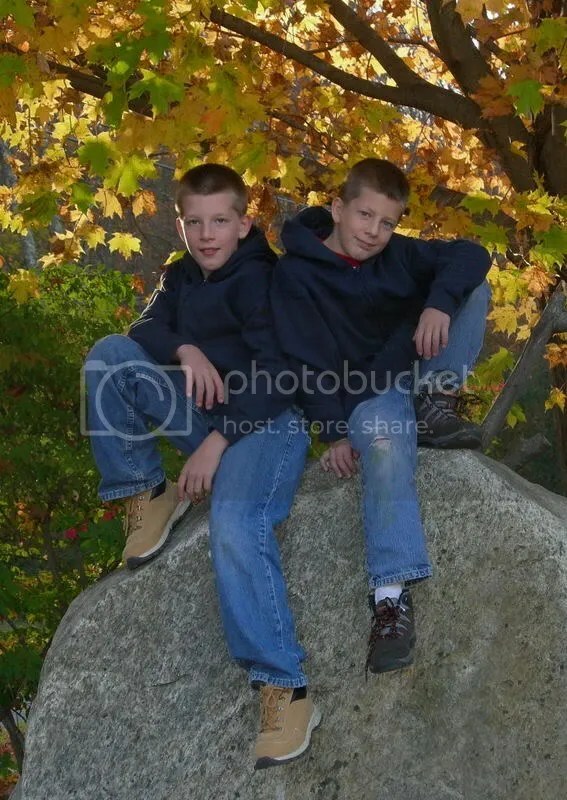 I thought it would be fun to include some older pictures of Jacob and Ethan. 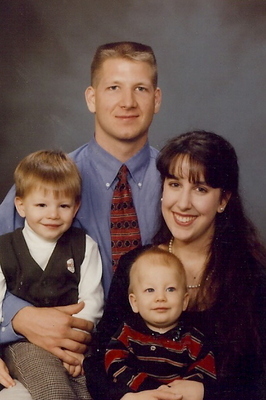 Here we are in 1998. They call this “Camp Hope”, they have forts all over the place. Rich and me with 22 month old Jacob and 8 month old Ethan. This was taken November of 1998 and Grace was born just 1 year later. This entry was posted in Uncategorized and tagged family by Shanda. Bookmark the permalink. They almost look like twins! You are so beautiful and happy- it’s easy to see you love your boys! What precious pictures! They do look like twins! What a great post, thanks for sharing it. I love the ages my boys are at, but I also can’t wait to see them the age yours are! They look like twins!!! How sweet!!! The second to the last picture is suitable for framing! With the leaves in the background…etc. What a gift the Lord has given you in your children. I’m sure God smiles when he hears the sound your heart makes everytime you look at them, or think about them. My boy is almost 25, and yet my heart still sees him at 6 months, at 3 yrs, at 7 yrs…etc. He will always be my “baby”. Seeing your pictures brings back so many wonderful, treasured memories. Thank you. I love your boys!! I love their creativity…their outdoor explorer personalities, their just kids but with Great imaginations! I was impressed when we were over- with all the things they were thinking through and coming up with…… you just do not see kids like that as much anymore….so many are hooked on videos, video games, and tv and miss out on adventure and thinking things through…. 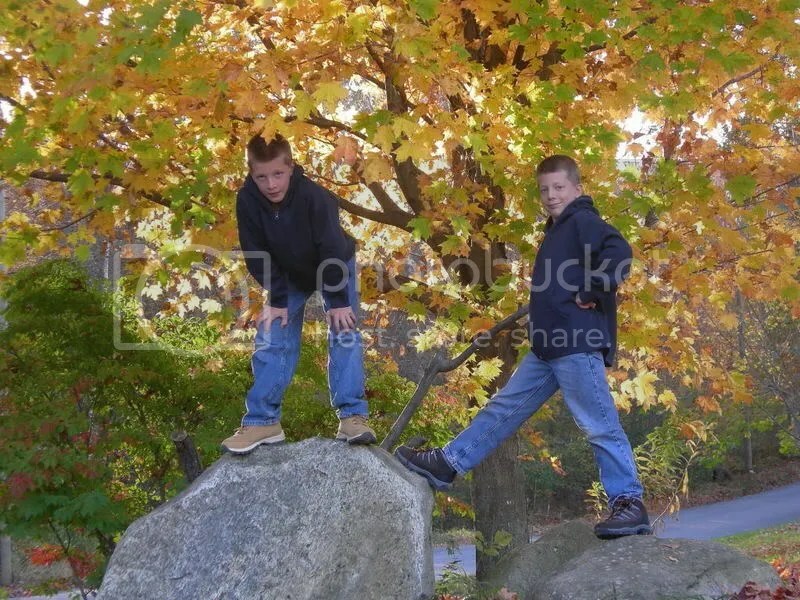 your boys are my inspiration, hoping that my boys will be somewhat like yours….. God gives each of our kids their own individual personalities but it speaks alot when mommy shapes them and allows them to explore!! 🙂 My husband also likes your boys…..he sometimes thinks that E is going to be a preacher! We’ll see what God has in store but whatever they do we pray that they will use all their abilities and talants to serve the Lord…..just think…He is preparing them right now for the future! One more thing, the last picture looks like Bigelow Commons walls…am I correct? I love the picture where you wrote “Me and my boys” your hair looks so pretty and it brought my memories right to those years. This post makes me look forward to Jeff and Eti at that age! Shanda, I have been watching your blog for a while now and I’ve noticed your pictures are getting better and better artistically. You really have an eye and I love these shots of your boys. The hands and knees shot is really a neat perspective. 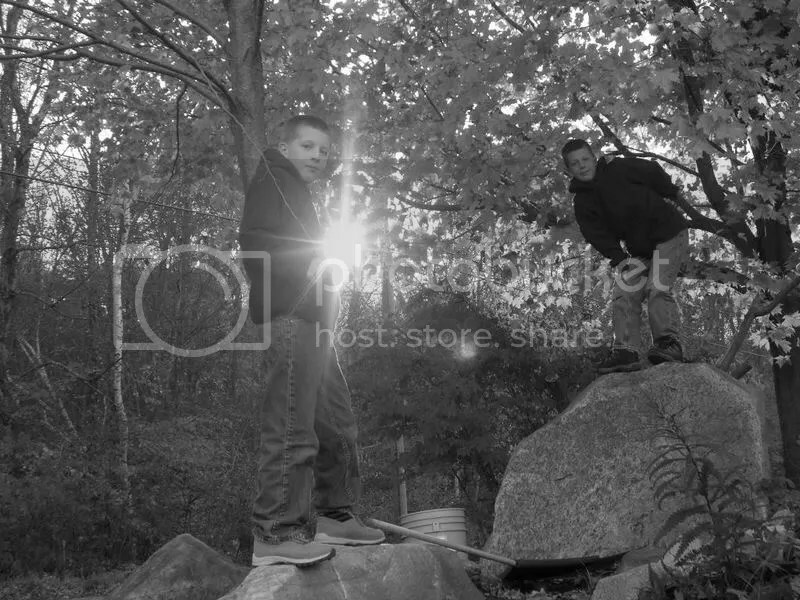 I liked the light shining at the camera in the one with the boys on the rocks at ‘camp hope’ too. You are preserving the moments of your family beautifully! thanks for sharing them with us! Thanks for sharing these pictures. They tell an incredible story looking back in memories and looking at the present. Wow! They look so much alike! I love the pictures. They’re really, really good! You really have a great eye for photography. 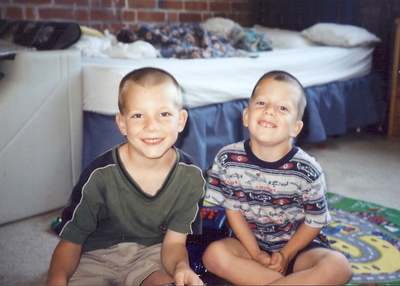 My younger brother and I are only 14 months apart and we grew up very close. I loved having a sibling that close in age with me! My two younger daughters are 12 1/2 months apart and they look a lot alike too. They are very close knit and Timmy is just 15 months behind them, so I had three in less than two and a half years. I have loved having them all so close and their relationship is just precious, like your boys! How neat. Thanks for sharing such beautiful pictures!!! I loved these shots of your boys. I remember watching them and coming over often to visit! I miss having you close. Thank God for Xanga!